Our Premier of this ongoing workshop includes a goody bag of fun items to use during the retreat and beyond! Optional: Bring a Bible to journal in (we suggest Journaling Bibles that have a space on each margin). We will provide a sketchbook and sample pages to try techniques on, so using your Bible is not necessary. 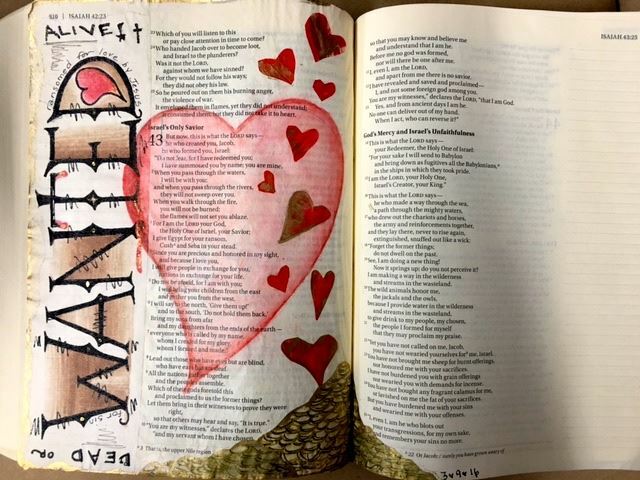 Take Bible journaling to a deeper level, beyond just illustrating the words! Learn tips for adding art and personal messages into your Bible, create together in our studio using verses that are special to you, and try a process that Nicole uses that makes Bible journaling personal to you by experiencing verses instead of just reading them. We will explore a variety of tools from the monks and saints of ancient days of Christianity that will bring more creativity to your spiritual journey, including word studies, Lectio Divina, the Examen, and a beautifully creative process called imaginary prayer. You’ll not only learn how to add the Bible into your journaling, but also how to add journaling DIRECTLY into your Bible . . . with gels, adhesives, art mediums, stamps, writing and coloring tools and more. This retreat allows plenty of time to play in the studio! Note: this retreat is Bible-based, encouraging you to use your favorite Scriptures and experience them in your own personal way in a private dialogue between you and God. As a optional resource, we offer Map 5 from the Listen to My Life Series (www.OneLifeMaps.com) as a reflection tool afterward. 1 - 3: Play and Create using techniques! Once you take the retreat, come every month to create and share your stories of God in your life! The Bible Journaling Monthly Share is FREE and a blend of both ART & HEART (encouragement). Come be part of this regular group and get to know each other -- whether you have something to share or not! Be uplifted and get ideas for using art to stay close to God. This group will meet monthly!